Tainan HSR Station quickly connects you with the west coast of Taiwan. Traveling along Taiwan’s west coast is a quick and easy affair due to the high speed rail. The Taiwan High Speed Rail Corporation started service for their high speed trains in January of 2007, and the Tainan HSR Station has been part of that route since the beginning. Traveling at up to 300 km/h (186 mph), the trains make the trip from Taipei to Tainan in about an hour and fifty minutes. Trains from Taoyuan Station (near Taipei International Airport), make the trip in about an hour and twenty minutes. The Tainan HSR Station is well outside of the city limits in amongst the vast plains of Tainan County. It is technically in a township called Guiren, though its also close to Rende, which is a suburb bordering Tainan city to the east. The station is surrounded by its own parking lots, broad highways, and open fields, making it feel more like a small airport instead of a traditional train station. It is a very clean and modern, glass and steel, two story structure with an elevated platform. The interior is both compact and open, with daylight offering much of the illumination. Facilities in the station include a 7-Eleven, Mos Burger, Sushi Express, and a cafe. 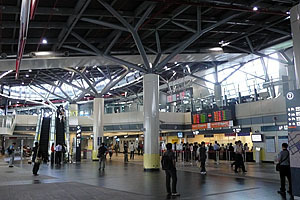 Additionally, there are car rental services, Taiwan Fast-Link, and taxi service counters inside the terminal. Parking costs NT$30 per hour for cars and NT$10 for motorcycles (though there’s nothing stopping you from parking your motorcycle on the sidewalk outside) with a maximum daily fee of NT$180/$50 respectively. 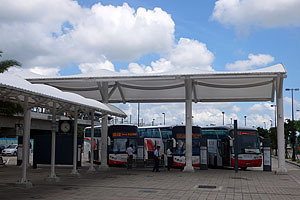 Free shuttle buses into Tainan City are available right outside of the terminal. The HSR trains are a very clean and comfortable mode of transport. There are two types of cars: standard and business class. The standard class is perfectly comfortable and spacious, but the business class compartments have better equipment, including larger seating, personal audio entertainment systems, and power outlets for portable electronics at each seat. In standard class you also have the option of traveling in reserved or unreserved cars. Unreserved is a little cheaper compared to a full-priced ticket, but you might be standing if all the seats are full. All compartments are equipped with air-conditioning and restrooms. A snack cart makes its rounds throughout the train offering affordable snacks, beverages and lunch boxes. A standard ticket from Taipei to Tainan on the HSR is about NT$1350. Discounts are also available depending on when you travel. Off-peak hours will get you either a Blue discount (15% off) or an Orange discount (35% off) depending on the time and day of the week. Check the Timetable and Fare Search for current ticket prices. Tickets can be purchased at the station, online, or at 7-Eleven or Family Mart convenience stores. 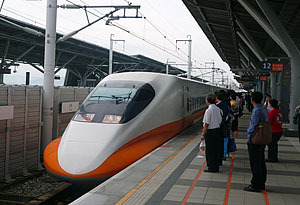 Taiwan’s High Speed Rail (THSR) complements the Taiwan Rail Association (TSR), but their services are not interconnected and their stations are far apart. While the traditional Tainan Railway Station services TSR trains and is in the heart of the Tainan City, the HSR Station is a long journey from the city. Supposedly a connector train run by TSR is in the works, but for now, the best options for getting to and from the HSR Station are to take a taxi, take the free shuttle service, or drive yourself. Taxis cost about NT$400 or $500 from Tainan City, making them a pricey option. The free shuttle service is a great choice. There are four routes offered on comfortable buses. View routes and schedules here (click on the services tab and choose bus routes starting with H). There are many routes you could take if driving yourself, but the simplest way is to drive east on Dongmen Road. Once you leave the city, Dongmen becomes Zhongshan Road. Continue along it until you come to Highway 39. You will see the raised HSR track running along the median of this highway. Turn right and continue until you get to the station. You can’t miss it. Love this website, I’m also an american living in Tainan city right now with my whole Family, andyour site is helping me a lot. I plan on going to Janfusun soon, do you think taking the train to Douliou and then cabbing it to the amusement park is the easiest way to go there?? the regular train of course not the HSR. Any suggestions?? I’m glad my site has been a help to you. As far as going to Janfusun goes, though, I can’t help you. I haven’t been out there. Your plan sounds good to me. I imagine most of the visitors to the Douliou train station are heading out there, so there will be line-ups of taxis offering flat rates. There’s probably shuttle buses as well, but I really don’t know. There is now no longer a shuttle bus running from the HSR station to the downtown train station. Instead, these two stations are now linked by a train. The new train station is adjacent the HSR station and the train schedule is coordinated with departures and arrivals of HSR trains. I will be visiting in June and staying at Shangri-la Hotel. What is best/cheapest way of getting there from high speed train station? If you’re going to the Shangri-la Hotel from the High Speed Rail Station, you just need to take the local train from the High Speed Rail Station to Tainan Railway Station (regular train). It costs very little and leaves from a station that’s part of the High Speed Rail Station. From the Tainan Railway Station, exit to the east side and walk one block east to the Shangri-la. If you have a lot of luggage, you may want to just pay the NT$450 (US$13) cab ride. The shuttle buses congregate outside of the station. They shouldn’t be hard to find. The one going to city hall takes about 30 – 35 minutes. It doesn’t make that many stops. You might cut that down to 25 minutes by taxi, but it will cost at least NT$400. I plan to leave Tainan city direct to Taipei international airport to catch my flight out at 3.00pm. What is the best way for me to do so? Will the HSR take me to the airport directly. Would really appreciate your advice. Taking the HSR straight to Taoyuan Station. From there you can take a shuttle for NT$30 to the airport (30 min.). If you’re flying China Airlines or Eva Airlines you can even check in at the Taoyuan HSR Station. You should have no trouble. I even let my parents do it themselves and they aren’t seasoned international travelers. How much would a taxi ride from HSR station to Queen Hotel in Yongkang? I’m not sure exactly, but Yongkang is generally a faster cab ride from the HSR than downtown. I’d say around NT$300 as a rough guess. I highly suggest you leave Tainan the night before and get a hotel near the Taipei airport. There’s no way to get from Tainan to TPE that early. I want to go to Taiwan Shoufu university. How can I go from Tainan High Speed Station? You should check with the university, because I haven’t a clue. It is quite far to the north of Tainan City and would be an expensive taxi ride. They might suggest taking the train line from the HSR station to the regular train station and then catching a local train a few stops north. I want to know, how can go to Tainan HSR station? My location is Dawan Road near Kun Shan University. Thank you! I am puzzled. So is there a shuttle bus running from HSR to Tainan City? Earlier tainancity mentioned that the service was stopped, but later period, mentioned there is. I am not sure which is which? Can any kind soul clarify on this? As far as I know, there are still 3 or 4 routes going for the free shuttles. I think they may have stopped service to the central rail station in the heart of Tainan City so that the buses didn’t conflict with the new rail service that runs from the HSR to Tainan Main Station. That train ride is cheap and will get you into the heart of the city faster than the buses, but the buses are faster if you’re going to certain places on their runs. It all depends on where you’re going. I’ll be taking the HSR from Taipei to Tainan in a couple of weeks. Is there any place to get current information on the rail link to the main train station in the city? Are the trains synchronized to the HSR arrivals? The trains are synchronized with HSR arrivals. I’m not sure how long they leave after arrival. Maybe ten minutes? Anyway, I’d imagine the most you’d have to wait is 20 minutes. Besides visiting tainan which is famous for snacks, is nearby chiayi, zhanghua and taichung also a good choice to visit? Comparing to taipei…tainan or taipei better? If I decides on tainan, is it easier to arrive at kaoshiung airport and travels to tainan, chiayi or even taichung or fly to taipei and travel all the way to tainan? I greatly prefer Tainan to Taipei, but I can’t speak for everyone. Tainan is more cultural and historic and is much smaller and easier to get your head around when visiting for a few days. The other areas of the south such as Taidong, Kenting, and Lugang are definitely worth visiting and Tainan makes a good hub for exploring the south. The Kaohsiung airport is more convenient and cheaper to access than the Taipei airport, but taking the HSR from the Taipei airport isn’t a bad option. You have to factor in flight schedules and cost differences when choosing the different airports to fly into. If it makes no difference in flight schedules and costs, and you only plan to visit the south, flying into Kaohsiung will save you time and money. Supposedly, there are now flights from Hong Kong directly to the Tainan airport three times a week which would be an even better option if you can make that connection. I hope that helps. hi, how do i get from taitung to tainan? is there a direct train, or do i need to get to kaoshiong then transfer? how long does it take? There are fast trains on the TSR that run between the two cities and take about 3.5 hours. If you have to take local trains and transfer it would be a lot longer. I would like to ask the journey from taipei to tainan take how many hour? Can u advise the best place to visit in taiwan because i planing to go taiwan on dec for 10 days? We are in quite big group (8 adult and 2 children)? Can u suggest the accommodation also? As it says on this page, the trip from Taipei to Tainan on the high speed train is an hour and fifty minutes. As far as where to go and where to stay in all of Taiwan, I suggest you buy a guide book or search online as that is far too broad a question than I can answer. I am taking the HSR to Tainan to visit someone living near Chikan Tower. What is the best way to get there from the HSRStation? It’s about a 400NT cab ride. You can take the local train from the HSR to Tainan Station and walk 4-5 blocks. There’s probably a shuttle bus that goes very close to Chikan Tower. Check outside the station to the left for which one it is. The information desk can help you as well. I will be in Taiwan next week. I want to go to Tainan University. If I want to use a normal train from Taoyuan airport to Tainan, how should I go about. May I also know how much will it cost and how long will it take? I have never taken the normal train from Taoyuan airport. I imagine you will have to take a bus into central Taoyuan as most normal trains are downtown. I’m not sure how far that is. Different trains have different costs and times, but I would guess it would take about 4 hours and cost about NT$500. Someone else might have more information. If you don’t want to pay the high speed rail cost, buses would be about the same price, a little faster and likely more comfortable. I’m pretty sure there are buses straight from the airport to Tainan. Sir, I’ll reach Taipei airport on 23 rd june around 11am. I’ve to go Chang Jung Christian University to attend a conference. Xan you please guide me in details how I can reach from the airport through high speed rail and also the approximate cost in usd.. There are details in this article on the costs and methods of getting to Tainan from the airport. I suggest you contact the university about how to get there from Tainan as I don’t know that school myself. I just know the Chang Jung high schools. Does the HSR from Taipei stops at Tainan Station which is near Shangri La? Also, we want to go to Hualien after Tainan. Do you think we need to book our train tickets in advance rather than on the day as we are travelling between the Christmas – New Year break? 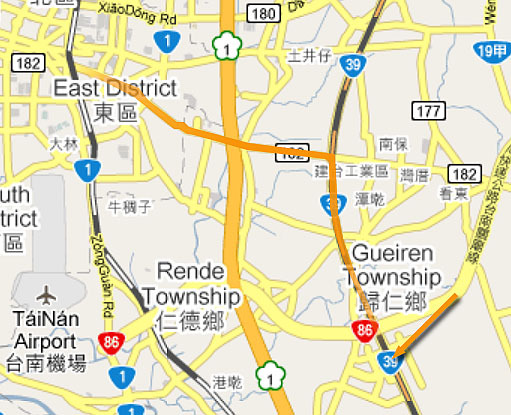 Another question – with the shuttle link in your post, are all of the lines/routes free or is it only the THSR Shuttle? We would like to go to Anping Tree House and we will be staying at Shangri La, so, I’m wondering if we should take the free shuttle to downtown Tainan. You are best off taking the regular train from the HSR station to Tainan Station where you can walk to the Shangri-La. You can’t take the HSR shuttles except to go to and from the HSR station. Go to the visitor information booth at Tainan station when you get downtown. They have bus information. I believe it is the 88 and 99 that run the tourist routes including Anping, and you can buy day passes. Oh, I thought the HSR Station is the Tainan Station as I can see that the Tainan Station is just walking distance to Shangri La. What about purchasing tickets online in advance for travels during Christmas-New Year? Is it essential or is it safe to buy on the spot? I read somewhere online that they could be full during holidays season. Sorry, one more question – some websites seem to suggest taxis are cheap at Taiwan and some say expensive. Shangri La charges $34 per person per way (I think) to pick us up from the HSR station. I assume taxis would be cheaper and are they readily available? Definitely book your rail tickets to Hualien as soon as possible. Getting around on the western portion of the island is generally ok, though these can fill up at certain times. The eastern portion of Taiwan gets booked up really fast as there are far fewer transportation options. As far as taxis go, it is simple and easy to get a cab from the HSR to Shangri-La. If people don’t understand the hotel you want, pronounce it like Shang Ge Li La and they’ll probably get it. With luggage, taxis are the way to go. It shouldn’t be more than NT$400, which is less than US$15. Would you please let me know if there is locker to deposit luggage at Tainan HSR station? Yes, there are large lockers available at the station. I am going to tainan on january 24,2016 and i saw your site on how to get there. can i purchase the round trip ticket on the same day in taipei station? and how to get there in taipei station if i am from zhongshan north road? Yes, you can buy round trip tickets or advanced tickets. And you probably get your tickets ahead of time if you’re traveling around Chinese New Year. Take the MIT red line to Taipei main station. You can also buy tickets online or at 7-Eleven. Having just returned from Taiwan a couple of weeks ago, I would totally recommend that you buy the tickets online and exchange it at the Taipei Main Station. We did it straight away after arriving the Taipei Main Station from the airport and it was very efficient and seamless. I love Taiwan’s efficient rail system! I will do that for my convenience. ‘Coz its my first time. Hi, I plan to visit Taiwan for 2 weeks end of December 2016. Can I buy HSR online tickets in advance? Do we need to specify the exact date and time of the HSR train that we want to ride? I am concerned about our arrival time of our flight. You can buy tickets online using the link in the article, but it would be for a specific date and time. Unless you’re traveling during a holiday or certain peak times, you should have no trouble buying tickets on arrival. I traveled during the same time end of last year and bought all my tickets in advance as I don’t like to wing it! It’s very convenient to pick up all the tickets as the bus from the airport drops passengers at the Taipei Main Station and you can go and pick up your HSR and Regional Train tickets at the station (although differen counters). The person at the counters speak English so, if you don’t know which counter the other type of tickets is, you can simply ask for direction. Just wanna know how far the evergreen plaza hotel from HSR station in Tainan? How long will it takes if I ride a taxi cab? The Evergreen Hotel. If I recall correctly, that’s the one by cultural center. It would probably take about 20 minutes to get there. About 300nt. I think there are free buses that stop there, too. I’m not sure though. I am staying at li duo hotel. Please help me the best way to go the HSR station. Hi, i am planning to come to Taiwan for an internship in STUST, Tainan. I’ll be reaching there on 6th of May. Can you please tell me how to reach No. 1, Nan-Tai Street, Yongkang Dist., Tainan City 710, Taiwan from Tainan HSR. Please mention the most economical way. I’ve read about some free shuttle buses but the time table and fare is not mentioned. Good day im planning to go to taipei this march from tainan can you advise me how can i go to thsr in the most easiest way? Im not familiar with place so i hope this site will help me a lot..